Despite the overly reassuring (and quite possibly fanciful) statements coming out of Egypt's MOH this year (see Egyptian MOH Statement: No Bird Flu Cases Since Last Summer) the expectation is many - perhaps even most - human avian flu infections go undetected. It's a phenomenon we've seen repeated in China with H7N9, where estimates (see Lancet: Clinical Severity Of Human H7N9 Infection) ran from 12 to 200 times the official number of cases, to the United States where Swine variant flu infections in 2012 (see CID Journal: Estimates Of Human Infection From H3N2v (Jul 2011-Apr 2012)) were estimated 200 times greater than reported. Similarly, Saudi Arabia has reported 1285 MERS infections to date, yet a seroprevalence study published last April in the Lancet (see Presence of Middle East respiratory syndrome coronavirus antibodies in Saudi Arabia: a nationwide, cross-sectional, serological study by Drosten & Memish et al., projected 44 951 (95% CI 26 971–71 922) individuals older than 15 years might be seropositive for MERS-CoV in Saudi Arabia. None of these are actual head counts, yet based on the limited serological studies that have been done and some calculations way above my pay grade, the numbers are probably reasonable extrapolations. Last year Egypt reported roughly 160 H5N1 cases, four time more than in any twelve month period before. These represented only those sick enough to be hospitalized, and lucky enough to be tested. Presumably some number were only mildly ill, were misdiagnosed, or otherwise lost in the shuffle. Last year we also saw evidence that the H5N1 virus in Egypt - which has been poorly controlled for a decade - had developed some `mammalian' mutations (see Eurosurveillance: Emergence Of A Novel Cluster of H5N1 Clade 2.2.1.2) that might have made it easier for the virus to jump to humans. Over the years we've seen several analyses indicating that most of the poultry vaccines in use have been ineffective (see A Paltry Poultry Vaccine) and may only have hidden signs of infection in poultry, allowing viruses to spread and mutate. All of which brings us to an EID Journal study, published today, that suggests there may have been tens (perhaps, hundreds) of thousands of human H5N1 infections in Egypt over the past decade. If true, it would dramatically lower the CFR (Case Fatality Rate) for the virus (a good thing), but it would aslo indicate the virus is more human adapted than previously thought (a not-so good thing). The authors base this assumption on a limited serological study that found antibodies for H5 in roughly 2% of the people tested. Even more remarkably, this study found 5.6% to 7.5% seroprevlance of antibodies to H9N2, an even less commonly reported human infection. I've only excerpted the abstract, along with a few choice selections from this lengthy, data-rich, and fascinating report. It is well worth reading in its entirety. In Egypt, avian influenza A subtype H5N1 and H9N2 viruses are enzootic in poultry. The control plan devised by veterinary authorities in Egypt to prevent infections in poultry focused mainly on vaccination and ultimately failed. 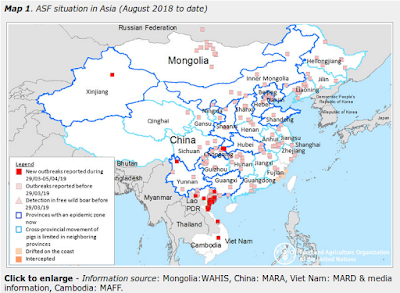 Recently, widespread H5N1 infections in poultry and a substantial increase in the number of human cases of H5N1 infection were observed. We summarize surveillance data from 2009 through 2014 and show that avian influenza viruses are established in poultry in Egypt and are continuously evolving genetically and antigenically. We also discuss the epidemiology of human infection with avian influenza in Egypt and describe how the true burden of disease is underestimated. We discuss the failures of relying on vaccinating poultry as the sole intervention tool. We conclude by highlighting the key components that need to be included in a new strategy to control avian influenza infections in poultry and humans in Egypt. An unprecedented increase in the number of human infections with the highly pathogenic avian influenza A(H5N1) virus was observed in Egypt during the 2014–15 winter season. The World Health Organization reported that 31 cases were confirmed in 2014, of which 27 were in persons infected as of September (1). The Ministry of Health and Population in Egypt confirmed 31 cases in 2014 and 88 in January and February 2015. Thus, the official number of cases during September 2014–February 2015 was 114, including 36 deaths. Furthermore, in February 2015, the first human case of subtype H9N2 virus infection in Egypt was reported. These events compelled national and international authorities to examine the reasons behind the increase in human infections and implement control measures. In Egypt, the number of reported human cases of avian influenza infection appears to be underestimated. An underestimation might result in an overestimation of the case-fatality rate, but it would certainly underestimate the extent of human infection with avian influenza viruses. Results from a controlled, serologic cohort study of persons in Egypt exposed and not exposed to poultry estimated the seroprevalence of antibodies against H5N1 (titers >80) at 2% (19). If this seroprevalence were to be extrapolated to the entire poultry-exposed population in Egypt, the true number of infections would amount to several hundred thousand. These figures are even more striking when it comes to human infection with H9N2 viruses. The seroprevalence of H9N2 antibodies detected in the same cohort study (19) ranged from 5.6% to 7.5%, whereas just 1 case of H9N2 infection was reported. H5N1 viruses elicit a poor humoral immune response, providing low antibody titers that typically fade over a short period (20,21). Thus, relying on serologic testing to detect prevalence or incidence of infection can yield underestimated results. 3) the poultry vaccination program is failing. However, our perspective was limited to the data available through our surveillance program, which might not be representative of the epizootiology of avian influenza virus in Egypt. Regardless of the causes of the recent increase in human H5N1 cases, this situation evolved because of the ineffective control strategy that was implemented. Controlling the situation requires a One Health approach, but certainly the greater share of responsibility now lies with the veterinary side. Dr. Kayali is a staff scientist at the St. Jude Children’s Research Hospital, Memphis, TN. His research interests are the epidemiology of influenza and viral zoonotic diseases.